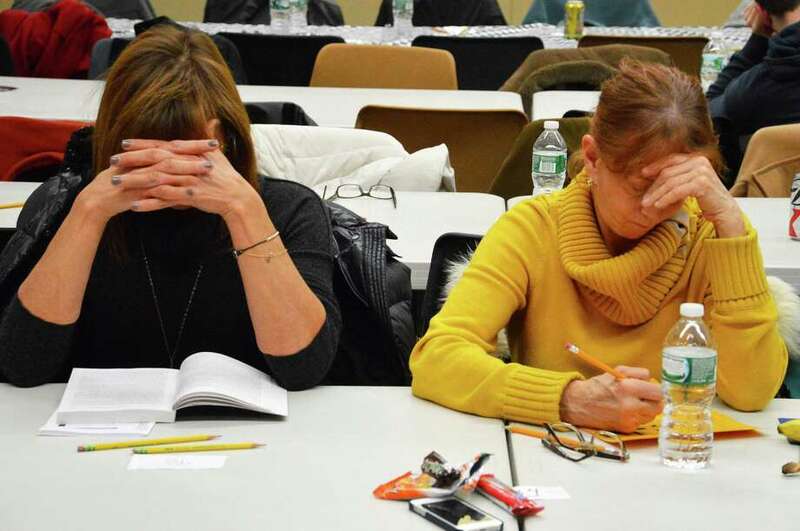 Joyce Eldh, left, and Lynn Whitton, both of Westport, concentrate on their puzzles Saturday at the 15th annual Crossword Puzzle Contest sponsored by the Westport Library. Ask any of the puzzlers at Saturday's annual crossword competition at the Westport Library a 10-letter word for fun, and they'll likely answer, "Will Shortz." Shortz, the New York Times crossword puzzle editor, again serve as puzzle master for the library's 15th annual Crossword Puzzle Contest, which draw nearly 200 enthusiasts. "I just love the puzzles and I love him," Don Sanders of Westport said of Shortz. "I've done crosswords all my life, but unfortunately I'm slowing down tremendously," said Sanders, who won two of the library's first three contests. Still, the competition offers puzzle fans a chance to challenge themselves -- and test their skills against others. "It's a solitary activity, and we give people an opportunity to come together as a community," said Maxine Bleiweis, the library director. Most of the participants had participated in previous tourneys, including Jim Minerly of Trumbull. "It's a bunch of nice people," he said, as well as being competitive. "I just enjoy doing it." There were four separate puzzles on Saturday's agenda, each with a 20-minute time limit. Some of the experts and former champions, such as Glen Ryan of Norwich, were able to complete them within four minutes. Asked why he enjoys crosswords so much, Ryan pondered before replying, "Words fail me," but then added, "You get to be all smart when you figure out the theme." This year, Ryan finished third behind Jesse Lansner and Andy Kravis of Brooklyn, N.Y., who also won in 2012. "It's a good mental exercise and I really like all the people here," Kravis said. "I've made a lot of friends in the crossword community." Prizes were also awarded to both Diane Lowman and Judy Cole, who won for the neatest handwriting in pencil and pen, respectively. "To have so much enthusiasm for a crossword tournament is wonderful," said Shortz, who provided the competition with as-yet-unpublished puzzles from next week's Times. This year's batch of puzzles was special because it included one composed David Steinberg -- a 17-year-old prodigy who serves at the crossword editor for the Orange County Register in California and who, at 14, was the second youngest person ever to publish a puzzle in the Times. Shortz, who considers him "amazing," said Steinberg is definitely following in his footsteps. "He wants my job," he said.